It’s probably just a coincidence that Eli and I were talking about SCTV the other day, because she had no way of knowing I had just picked up a couple of books about The Second City (one about the history of the theatre; the other about the television show). I hadn’t planned on reporting for Jury Duty on the first day of Summer, but having been through the drill before I knew that I’d probably have to kill a little bit of time. As it turned out, it was a good thing I brought both books. 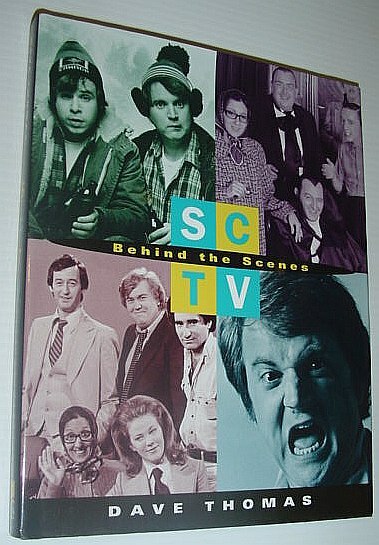 The first was one I had read before, an insider’s recollection by Dave Thomas about the show, the cast, and how it all came together called SCTV Behind The Scenes. Thomas weaves personal observations with interviews with others into an engaging narrative about the origins of the program as well as the camaraderie – and sometimes rivalries – between the cast members. In doing so he is unflinchingly honest about his own myopia and drive which sometimes placed him at odds with fellow actors and staff while trying to put the show first. There’s a lot of inside peeks at the process of turning writing sessions into post-produced pieces for air; how despite comparisons to Saturday Night Live the shows were really apples and oranges; how dedicated behind-the-scenes people from makeup artists to producers were usually in way over their head but delivered anyway. Despite the incredible difficulties involved in staging and (mostly) selling the show, their ability to self-create in a vacuum without regard for ratings or network input led to what most of them consider the artistic peak of their careers. 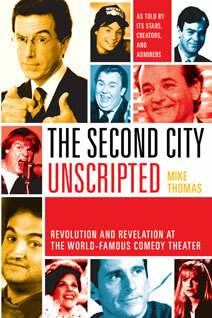 Unscripted, written by Mike Thomas (A Chicago journalist, no apparent relation to Dave) is a 2009 book that presents a fascinating history of the Second City theatre framed within quotes from its creators and participants. Although the Chicago side of the story dominates – as it should – Thomas pays great tribute to the Toronto establishment and sheds light on the many road shows and other city-based affiliates. If you’ve read Live From New York by Tom Shales and James Andrew Miller – among the best tomes on Saturday Night Live – you’ll be familiar with the structure that Unscripted utilizes. Both authors conducted a bevy of interviews and weave quotes and anecdotes from the insiders to tell a chronological story. 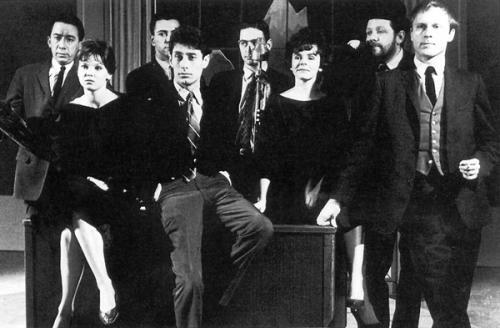 It’s an effective technique – as if a group of famous people are gathered in one room and they decided to tell you the history of their theatre in a round-robin format. And we’re talking famous people. A fifty year history, from early stars like Alan Arkin, David Steinberg and Robert Klein to the recent TV pipeline of comedians Tina Fey, Steve Carell and Stephen Colbert. Most of the better cast members from Saturday Night Live. Ensembles from classic sitcoms from Cheers to 30 Rock. Actors like Peter Boyle. Stand-up comics like Joan Rivers. Of course, many will gravitate towards the bittersweet stories of the departed legends John Belushi, Chris Farley, and John Candy as well as famous stars like Bill Murray and Mike Myers who parlayed their improv training into huge careers. 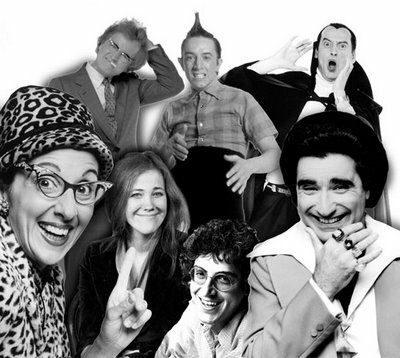 The list of Second City alumni is daunting. 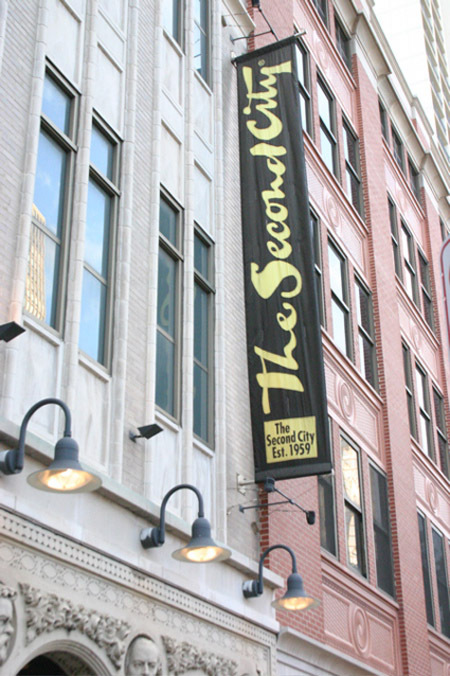 It’s fun to read about Second City and its history, but it’s great to know we can take in a live performance and revisit the brilliant television show on DVD. Info about Unscripted at the Mike Thomas webpage.